With the weather having finally really cooled down here in Wisconsin (and by that I mean no brief spurts of 50 degree weather), it's time to break out all my cold weather staples and stock up on ones I need. Whether you're running errands in the snow, going to a friend's to bake cookies or curling up at home on a cold night, there are a few things I consider crucial to have in your wardrobe. A comfy and warm pair of winter boots is always a must, as well as a thick pair of socks to go with them. When you're heading outside, a coat (extra points if it's furry! ), hat and scarf are perfect to keep you nice and toasty. And of course, a great cable knit that you can layer under it all. Check out my essentials above! And don't forget to follow along on Instagram to see snaps from my trip! Cold weather wear is my favorite! I love that scarf and the cute pom pom hat! 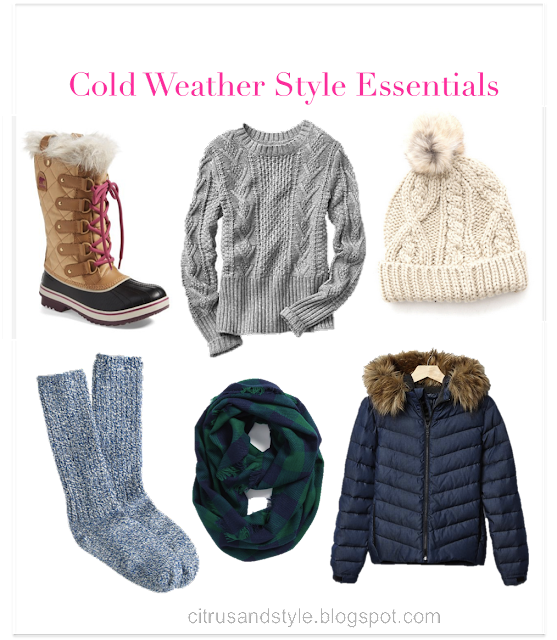 Great essentials,all of these look like such great things to stay warm with.